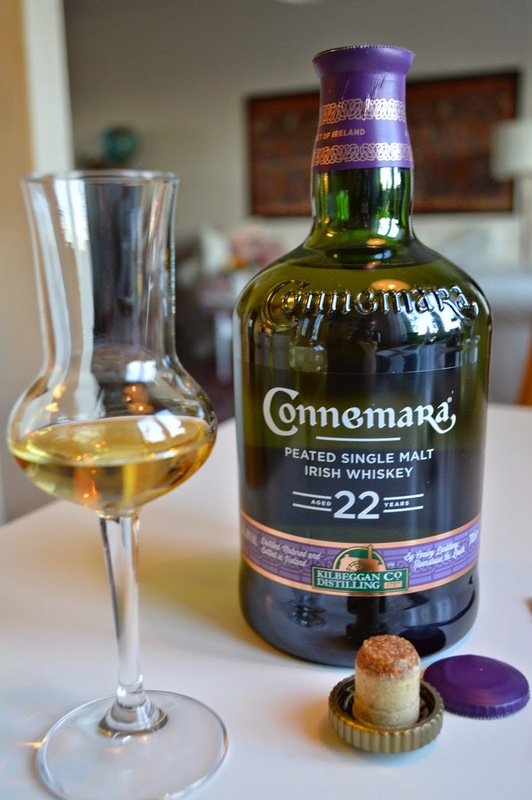 SamuelWhisky turns 1yo – Celebrates with tasting the all new Connemara 22yo! You can pick up this new expression in store at the Celtic Whiskey Shop for 170 euros and it is about to become available online any time now. You might also find it in various stores in Germany, or like I did, pick it up via ebay.de if you are fast, and lucky! I have not been blessed with all info yet but as far as I know it has been matured in first-fill bourbon barrels only, from some of the first stocks produced and laid down in 1991/1992. (Although I’ve heard there is some even older Connemara maturing in the warehouses from 1989 so if we are lucky we might see a 25yo soon. Who knows?!). The only thing regarding number of bottles produced that I’ve heard is around 4300 so definitely a small batch. During my visit to Kilbeggan Distillery this summer, my contact in the company told me that if it sells well it will probably be a ”standard bottling” all though, in very limited quantities of course. It holds 46% ABV. Well let’s have a taste! Incredible big, or rather huge vanilla! And when I say huge I mean huge! Vanilla ice-cream, almost like that beautiful old style Kilbeggan-vanilla-ice-cream they serve at the Kilbeggan Distillery. Surrounding the vanilla is a very soft but very present touch of peach, almost candy-like peach. There is also soft sort of mint or menthol mixed with soft earthy liquorice. Touches of honey melon, a bar of milk-chocolate… Mmm, everything is veeeeery soft and calm, perfect balance between all the stuff that’s on the nose. Definitely very much in the style of Connemara with that green, earthy/woody touch, if you know what I mean? This is so elegant you can’t even believe it friends… ”Well what about the peat? !” you might ask, well you see folks, it lures in a mysterious way beneath everything else ☺ very mature and mellow. Let’s have a sip! I have said it many times before regarding other whiskies, but W-O-W! This Connemara is complex stuff! Beautiful sweetness in combo with liquorice and elder-flower actually, at the tip of the tounge the first second or so, but then, there’s not a boom but rather a slooow wave of soooft peat flowing through my mouth. The peat is much more present on the palate than on the nose, which makes me happy. The fact that there is still so ”much” peat on the palate after this many years of maturation is just great. A really earthy/forrest-y tone is part of it all, that makes everything become so much Connemara. A long lingering soft peat and vanilla in perfect interplay. The aftertaste is not dry at all, but rather mouth-watering… Seriously people, I’m not exaggerating a bit, the balance is wonderful. Thank you for staying tuned to SamuelWhisky during my first year as a blogger and please do keep in touch, why not on Facebook through this link, or on twitter through this link. Sláinte and here’s to another exciting year! Welcome to SamuelWhisky! I'm Samuel Lindlöf and this is my blog where you can find EVERYTHING in my life that has to do with WHISKY (hence the very imaginative name SamuelWhisky); my tasting notes and reviews, the tastings I conduct in bars, restaurants, for clubs, as well as private tastings. The festivals I work at (for Edrington), as well as the occasional distillery-visits, whisky travels and events I attend. My tasting notes and the whiskies I review are a mix of whisky that I've bought myself, and whisky/trade samples/products that friends in the business send to me because they want me to review it for them. I always write in each separate post if it is a whisky I bought for myself or if it is from someone in the business. Please enjoy and Sláinte!